Food, celebration, tradition and identity are very closely linked. It is often in food that celebration manifests itself. We celebrate with food. We celebrate the food itself but more importantly we celebrate our memories. We celebrate a sense of connection to ‘our world’, our identity. So what happens then when we move? When our world changes, when the traditions that surround us change? But even more importantly, when our own identity shifts, adapts and changes? A lot of what we eat is probably enjoyed more because of its association with the past, with our own past, than the foodstuff itself. Any foreigner trying to enjoy an Aussie Christmas roast in 40 degree heat will know what I am talking about. What other reason is there to enjoy hot, heavy and stodgy food in the middle of summer than for the sake of childhood memories. It is the inherited and collective association with Christmas cheer that dates back to the Anglo Saxon roots of Australia. It takes every joyous childhood memory to make that stodgy Christmas pudding taste so good. But believe me, Christmas is not the same without it. Then again to shift, to move obliges modification. So why do some customs and traditions withstand this demand for change while other concede to its iron will? In my family the steaming brandy custard has had to make way for vanilla ice-cream, but this is the only heat induced modification to Christmas that has been approved by the generations. So my question is, why are some things as sacred as the proverbial cow, while other things not? This same phenomenon also works in the reverse. For all the years I lived in Sweden, I was fascinated that at Christmas time an entire nation, now well accustomed to eating all manner of imported and luxurious foods would stop to indulge in dopp i grytan and lutfisk,and enjoy it!? I never learned to look at either of these dishes as delicacies nor festive food. I remained cautious. I viewed these national culinary icons as the ultimate example that we eat and enjoy the food of our memories, albeit with gusto, for the memories themselves. The flavours, textures and rituals are so imbibed with fond memories and that is the point. All handed down from generation to generation as part of the pageantry of celebration. So when I went to meet the Helé family at the Hunter Resort, I was very curious to see how a Danish/Australian family with old, established and even distinguished traditions within the food and hospitality industry in Denmark had managed their transition. What changes had been permitted and what has stayed the same. Let’s face it, the move from distinguished Hoteliers and caterer, by appointment to the Danish Court, to purveyors of food, wine and hospitality in the Hunter Valley is quite a step. Great changes on the one hand yet much remained the same. The theme of food, wine and hospitality remained constant even if the setting was quite different. So, what have they kept the same for the sake of their memories, or as the result of learned experience and the proven ingredient of success? What have they jettisoned in the name of integration into Australia? And what have they absorbed and learnt which reflects the new world they inhabit? The Helé family comes from a long and illustrious line of hoteliers. The present generation Philip Helé became the fourth generation in this family to own a hotel when they purchased the Hunter Resort in 1991. Their maternal Great-Grandfather, Ernst Weinold was the owner of the Grand Hotel in Copenhagen from 1935 to 1970. With rooms costing the extravagant amount of 3.50 Danish Kroner per night, this was an exclusive hotel. The elegance of the dining room and sumptuousness of the meals were important. It was a necessary part of the services provided at a time when people still ‘dressed for dinner’. Ernst understood that a successful hotelier needed to provide good food, fine wine and an elegant ambiance. The Grand Hotel is still found in central Copenhagen today on Vesterbrogade near the Tivoli, Rådhuspladsen and Strøget. Next in line came the Grandparents, Wibrand and Elli Kesby who owner the Hotel Eyde in Herning during the second world war and went on to build the Richmond Hotel Copenhagen in the 1950s. In keeping with family tradition the Richmond was an elegant ‘International’ standard hotel. It was considered among the best hotels in Denmark. The prestigious Fielding’s Travel Guide to Europe in 1967 stated that, ‘The Richmond Hotel offers just about the top – international cuisine of the country – it’s new Snack Bar is a twentieth century stunner.’ Whilst in Egon Ronnay’s guidebook of Scandinavia’s Best Hotel and Restaurants of the day says; At it’s frequent peaks the cooking is undeniably – three star, deserving it’s distinction of catering to the Danish Court, and complemented with a connoisseur’s wine list.’ The Richmond is still there on Vester Farimagsgade today even if the Kesby’s are not. After Wibrand’s death Elli continued to run the hotel until it was sold to the famous Simon Spies in 1974. Parents Julian and Anni Helé kept the ‘tradition alive’. They met at the Dorchester Hotel in London, married whilst working at a hotel in Montego Bay, Jamaica and worked for Hilton Hotels in the US before arriving in Australia in 1964. In the spirit of this maternal lineage the Helé’s established themselves in the Australian hotel and hospitality industry and prospered. Through the years they have owned the Yachtsman Hotel in Lake Macquarie, The Ascot in Wahroonga and the Sackville Hotel in Balmain. Yet their greatest innovation was the development of something as quintessentially Australian as the grill house with buffet. This Aussie classic took on a new twist thanks to the old family adage that good food is made from high quality, local primary produce. They only served top quality beef together with fresh, crisp salads and local condiments on a buffet. We now get to Philip Helé OAM and the unsurprising fact that he too has followed his parents into the hotel business. As General Manager of the Hunter Valley Resort, Philip is also very passionate promoting the many things one can enjoy in the Hunter Region. 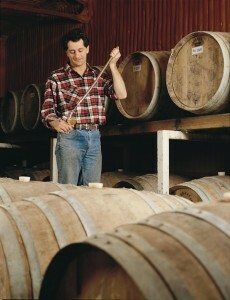 In fact he is known as “Mr Hunter Valley” in the international marketplace! 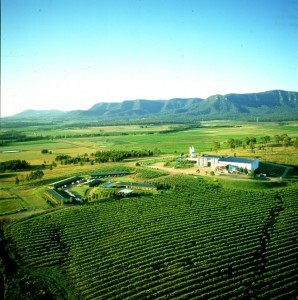 In the 2014 Queen’s Birthday Honours list, he was awarded the Order of Australia Medal (OAM) for Services to Australian Tourism and the Hunter Valley Community. Wibrand and Elli Kesby were the chosen caterers to King Frederik IX of Denmark and Queen Ingrid for many years. It was their responsibility but also their pleasure to cater for many royal events. When the heir to the Danish throne Her Royal Highness Princess Margrethe married Henri Count de Monpezat on the 10th of June 1967 the Kesby family and the staff at the Richmond hotel were employed to prepare and serve the wedding dinner at Fredensborg Castle. They also catered for the wedding of Princess Anne-Marie when she married King Konstantin II of Greece in 1964, as well as other events for royalty and dignitaries. Good food is made from good quality local produce and an appreciation that the right wine is a compliment to the food is the family theme. This fundamental belief is the touchstone of their business activities and the key to their success. It has moved from generation to generation. The produce should be local, must be good, needs to be quality controlled is the mantra. Wibrand used to go himself to France to pick his own truffles. He was a man so sure of this fact that he served the game that he hunted himself in Denmark, at the restaurant. To put it in modern ‘lingo’, he was a total gourmet and firmly believed that your own produce or at least local produce was the secret to exquisite food. Today in the Hunter Valley, they insist on using local produce wherever possible. The visitor indulges in contemporary meals created from regional produce served in the beautiful setting. The focus is on local produce with an Australian accent which highlights both what has changed and what has stayed the same. The tradition of keeping it local, keeping the quality of the produce high has remained while the ingredients, the recipes and even the produce themselves have changed. 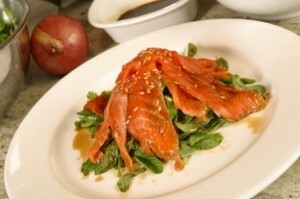 Euphemistically,Gravlax has morphed into the Asian inspired Sugar cured Ocean Trout with fresh ginger. This classic Scandinavian dish is still recognisable yet changed and Australianised by virtue of an Asian touch. The family still have their Danish traditions and customs. Anni tries to keep the Danish traditions alive by baking the traditional Christmas biscuits, Vaniliekrans and Brunkager. Once in a while they even serve Duck with red cabbage. When I asked if their family still celebrated things Danish, they immediately replied that the family celebrated Christmas on the 24th of December, always had a real tree and ate Ris à L’amande for dessert. I liked the real tree bit, simply and succinctly said it revealed as much about their Australian-ness as their Danish-ness. Some family traditions are exactly that, family traditions, with their strong but subconscious expression of identity. Our story began in Copenhagen a city oozing with European culture and Scandinavian chic. A story beginning among royalty and fine dining and ends nestled amongst gums and the Brokenback Ranges and the famous Hunter Valley Wine Country. The setting is very native Australian, it is a bush setting yet modern and stylish, and so what remains of the Scandinavian? What remains are the roots, the values and the raw materials before they metamorphosed into something Australian. It is this conglomeration of the old and the new which is so essentially Australian. So it is this never ending mixture of cultures and traditions that makes the Helé’s actually very Australian… in the best possible sense of the word.